Part 1 Introduction: Challenges of bone repair; Bone anatomy, physiology and adaptation to mechanical loading; Bone repair and regeneration; Biomechanical aspects of bone repair. Part 2 Biomaterials: Properties and characterisation of bone repair materials; Metals as bone repair materials; Ceramics as bone repair materials; Polymers for bone repair; Composite biomaterials for bone repair; Cements as bone repair materials; Bioactive polymer coatings to improve bone repair; Long-term performance and failure of orthopaedic devices. Part 3 Clinical applications: Using bone repair materials in orthopaedic surgery; Bone tissue engineering; Retrieval and analysis of orthopaedic implants; Ethical issues in bone repair and bone tissue engineering. Bone repair is a fundamental part of the rapidly expanding medical care sector and has benefited from many recent technological developments. With an increasing number of technologies available, it is vital that the correct technique is selected for specific clinical procedures. This unique book will provide a comprehensive review of the materials science, engineering principles and recent advances in this important area. The first part of the book reviews the fundamentals of bone repair and regeneration. Chapters in the second part discuss the science and properties of biomaterials used for bone repair such as metals, ceramics, polymers and composites. The final section of the book discusses clinical applications and considerations with chapters on such topics as orthopaedic surgery, tissue engineering, implant retrieval and ethics of bone repair biomaterials. 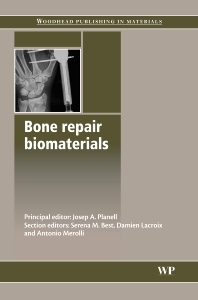 With its distinguished editors and team of international contributors, Bone repair biomaterials is an invaluable reference for researchers and clinicians within the biomedical industry and academia. For all the professional that want to have an up to date information about trends and innovations in the area. Great book for all the professional that want to have up to dated information and the new innovations in the area. Professor Josep A. Planell is highly regarded for his biomedical research at Universitat Politècnica de Catalunya, Spain.